Resources | Mediterra - Swim & Run Better Than Ever! Popular posts, videos, charts, and instructions to assist your training. The official Finish Tempo Trainer Manual (pdf download). Meet The Tempo Trainer Pro article. How To Use A Tempo Trainer Intro article. How To Use A Tempo Trainer – SLOW IT DOWN practice. How To Use A Tempo Trainer – SPEED IT UP practice. You may find examples of rehearsals in the beginning of most chapters in the TI Perpetual Motion Freestyle video series by TI Head Coach Terry Laughlin (download, $29.95). Or, you may study Coach Terry’s latest refinement of the Freestyle Drill Series in the new (2015) Ultra-Efficient Freestyle eBook and Video series package (download, $49.95). Looking For A TI Coach Near You? You may find a listing of many coaches, according to location, on this page on the Total Immersion site. For some strange reason not all of the currently certified coaches are listed there. If you’d like to check a name to make sure the coach is currently, and truly certified by Total Immersion you can check this exhaustive list on the Total Immersion site. If you don’t see their name on either of these lists, then just ask that coach to explain. Maybe there is a good explanation. These metrics can be combined and adjusted in an infinite variety of ways to create a totally personalized practice set, with the perfect amount of challenge for any human swimmer – beginners to the world-record holders. Stroke Count refers to the number of strokes (strokes per length, or SPL) it takes the swimmer to cross the pool, accounting for the push-off and glide until that first stroke. For mathematical purposes, stroke Length (SL) is the inverse of SPL. Tempo refers to the number of seconds taken for each arm stroke (at any consistent point in the stroke cycle). Some prefer to measure in terms of strokes per minute (SPM), otherwise known as stroke rate. Stroke rate is the mathematical inverse of tempo. Pace refers to the amount of time (in minutes or seconds) it takes to swim a certain distance. We tend to be most familiar with a swimmer’s pace per 100 meters, or per 25 meters. Speed (i.e. velocity) is the mathematical inverse of Pace. We prefer to use the term Pace because it is a much more common reference point among swimmers. Distance refers to the distance a swimmer can or will cover in a continuous swim (without rest intervals). Similarly, duration refers to the amount of time a swimmer can or will swim continuously, without rest. Rest refers to the amount of time a swimmer will take to either stop moving during a swim, or slow down into a more restful pace or activity (like doing a drill). Rest is both to give the energy system time to recover strength and give the brain time to recover attention. The intensity is analogous to our experience with running for an common reference point for us land-mammals. 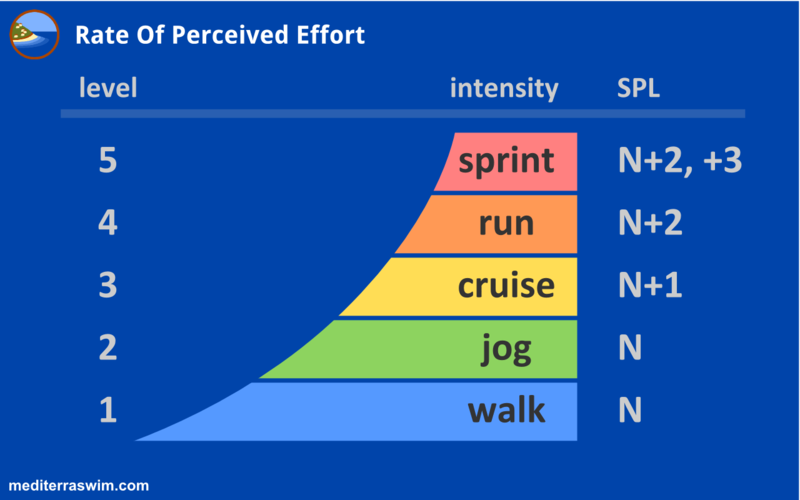 It is easier to relate to the effort and its speed effect in the progression from walk to sprint. There is a corresponding level of 1 to 5. 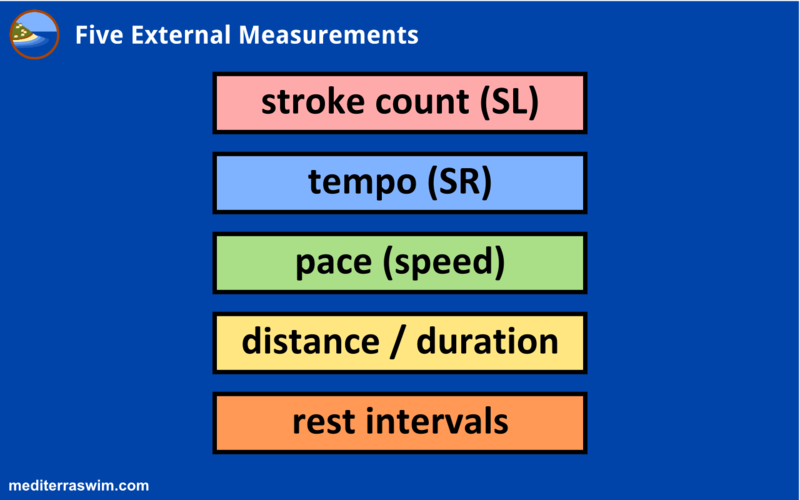 Next to these intensity levels are the variations in Strokes Per Length (SPL) we may allow in a 25m pool. Add 1 to 2 strokes to the variance for SPL in a 50m pool. Stroke Counting is the first objective metric we teach swimmers in TI and one of the most important. It is the first indicator of how efficient the stroke is. We use the term Strokes Per Length (SPL) which is the number of strokes taken across the pool. This assumes a push-off and glide distance from the wall. And the count depends on the length of the pool. So be aware, if you want to compare your SPL to another swimmer’s SPL you need to know if your push-off and method of counting are the same or not. The standard way of counting among TI swimmers is this: Push-off from the wall in streamline body position. When the first hand begins to catch the water this is Stroke moment #0. When that hand comes around and touches the water to begin the extension forward, that is Stroke #1. Count each hand as it touches the water after the recovery. Getting a consistent reading on your SPL depends on having a consistent push-off from the wall, and finishing at the far wall in the same way. You may notice if you would finish the last stroke right at the wall or if you would need to glide a bit farther to reach it- you may note this in your stroke counting. I tend to count in 1/2 stroke increments, aware that I used another extra 1/2 stroke or glide to get to the wall. These charts will help you estimate your general Stroke Count, or in technical terms, your Strokes-Per-Length (SPL) range. This chart is for SPL in a 25 meter pool, assuming you take a 5 meter from push-off to first stroke. This chart is for SPL in a 25 yard pool, assuming you take a 5 yards from push-off to first stroke. This chart is for SPL in a 50 meter pool, assuming you take a 5 meter from push-off to first stroke. If you switch between 25 m and 25 yd pools a rough rule-of-thumb is to allow for a 2 stroke count difference between your SPL in the two pools. A 25 meter pool is approximately 2.3 yards longer than a 25 yard pool, and that extra distance equals about 2 strokes for people of middle height range. In practices listed here on the TI Academy, when we refer to SPL, we will use terms like N, N-1, N+1, etc. N = the lowest number in your optimal SPL Range. It’s not the lowest SPL you can possibly achieve, but the lowest within the range of appropriate SPL for your continuous swimming – in that range that is good for your energy use and shoulder health. If you have an SPL Range of 16 to 19, then your N = 16, N+1 = 17, N+2 = 18, N-1 = 15, etc. How these charts are calculated. Based on observation of swimmers and comparison of data we see a strong case for setting a swimmer’s SPL range between 55% and 70% of their wingspan. 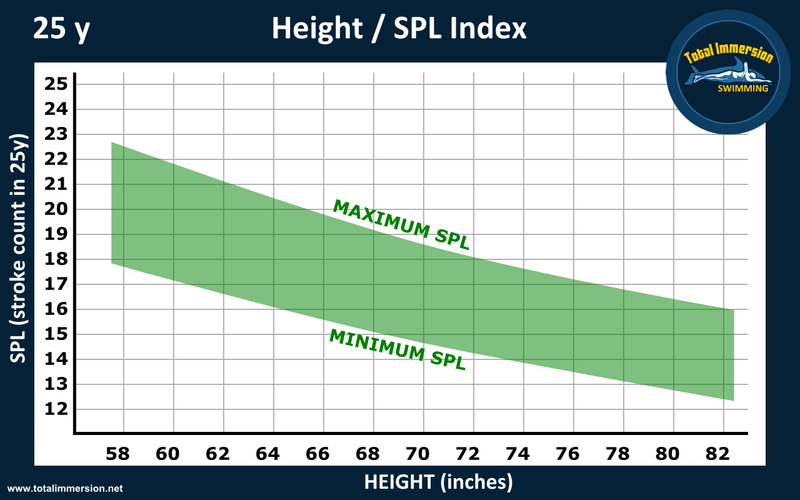 The minimum SPL on this chart corresponds to 55% of height and the maximum corresponds to 70%. We chose to use height for these charts because most people know immediately what their height is, and for estimation purposes, that is close enough. Wingspan is the measurement of your arms spread wide, measured from finger tip to finger tip. 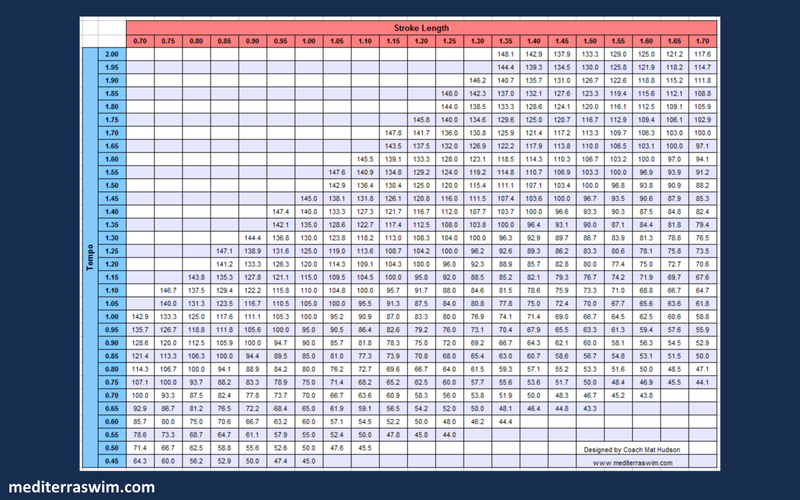 Wingspan provides the more accurate estimate of what your stroke length potential is. In humans height is approximately the same as wingspan, within +/- 5% margin of difference. We see this difference between height and wingspan also matters but we’ll save that discussion for another article. Then we start the calculations working with Stroke Length (SL). Then we convert from SL to SPL which is dependent on your pool length and glide. How far you glide after pushing off from the wall to your first stroke affects your stroke count. If you followed the math calculations above you’ll notice that a short push-off will require you to take an extra stroke or two to reach the far wall, while a long one will allow you to take one or two strokes less. Work on keeping this push-off and glide distance consistent on every lap. If you have a long glide (5-6 meters) you can aim for a lower end of your SPL range. If you have a shorter glide (3-4 meters) you can aim for the higher end of your SPL range. 4-5 meter push-off to glide is a good average to aim for. This chart estimates a range of about 5 SPL counts. However, through testing and practice we recommend that you narrow your personal range down to 3 SPL counts. 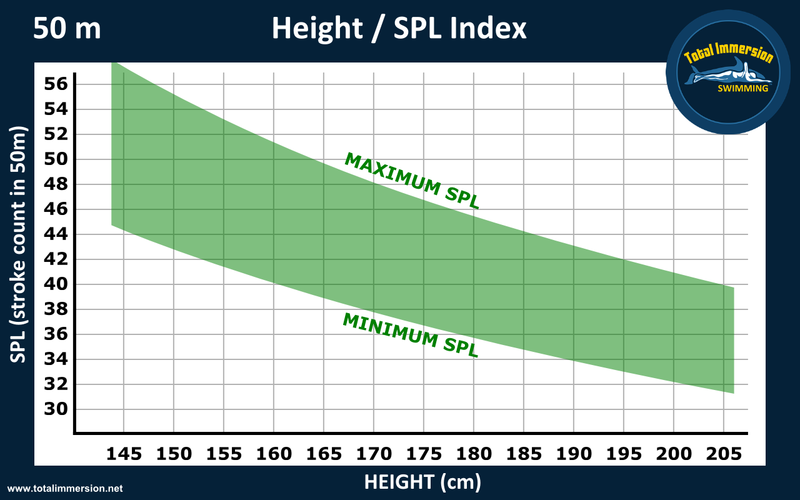 For example, for a male swimmer about 40 years old, 180 cm tall, the chart above suggests a 16-20 SPL in a 25 meter pool. If he has highly developed streamline and stroke efficiency he may aim for 16-18 SPL as his target SPL range. If less developed he may aim for 18-20 SPL. What is the SPL Range for? Changing SPL during a swim functions a bit like switching gears on your bicycle, allowing you to adjust the pressure and frequency of the stroke to use energy just the way you need to for a particular event or conditions. 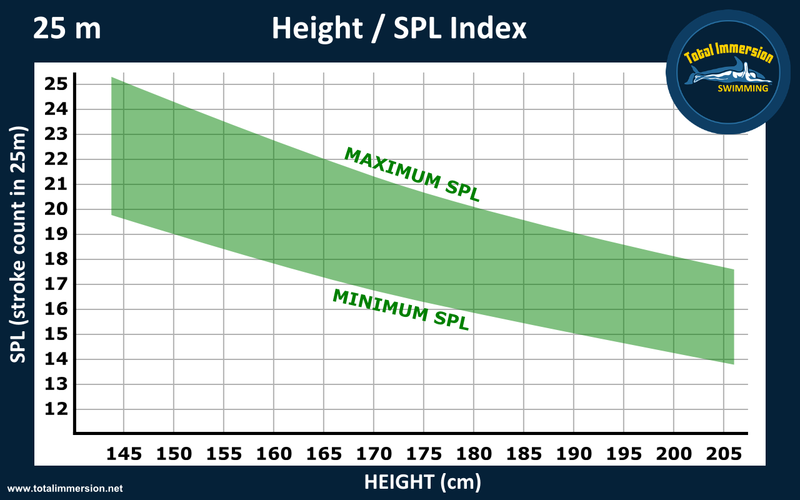 Your higher SPL count is generally for shorter distance, higher tempo, or lighter pressure strokes. Your lower SPL count is generally for longer distances, lower tempo, or higher (steady) pressure strokes. 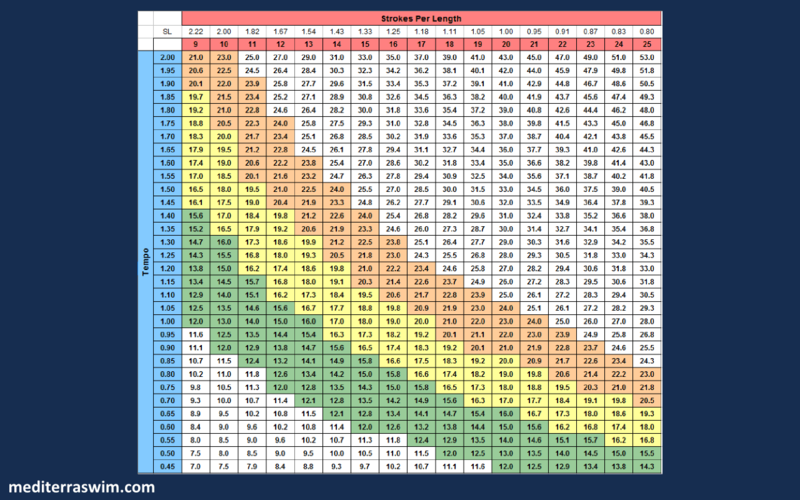 This chart shows Stroke Length x Tempo Combinations to create Pace for 25 meters/yards. This chart is intended for the pool so that push-off distance and seconds to your first stroke are taken into account. Stroke Length (SL) is given in the white row, and Stroke Per Length (SPL, for 25 m/yd) in the red row. For example: Maria swims in a 25 meter pool. She glides 5 meters from the wall to begin her first stroke #0. She has an average SPL of 19. 25m – 5m = 20m Swim Distance 20m / 19 SPL = 1.05 meters per stroke. Catch – the point where foreward arm is positioned to ‘grab’ the water, with the palm facing back, fingers down, elbow rotated out and high enough so that the forearm is nearly vertical. Bonk – when you run out of energy really, really bad in the middle of a workout or race and barely make it back home. FG – Fistgloves, or pull fingers gently into a fist and swim this way – Fistglove swimming is used to build a stroke which uses the entire forearm and hand to press against the water. Focal Point – an image or idea held in your mind which allows you to send specific commands to your muscles for better stroke control. Repeat – In a practice, swimming is broken down into sets with a pattern of shorter swim segments. Each of these swim segments is called a repeat. Example: Swim (3x 100m), where 100m is the repeat distance. Recovery Arm – the arm that is being pulled out of the water and being swung forward, returning to the entry position. Round – In a swim practice, swimming is broken down in sets with a pattern of shorter swim segments. These shorter patterns may be performed several times – each of these is called a round. Example: Swim 3 rounds of (3x 100m). Set – In a swim practice the total distance swam may be broken down into smaller segments, each with a particular agenda or assignment. This smaller segment is called a set. Example: Main Set = 4x (50 + 75 + 100 + 75 + 50) = 1400 meters total distance. Stroke Length (SL) – the length the body travels through the water on each stroke. How to measure stroke length- it is more of an estimate really. Take the length of the pool you swim in and subtract the distance from the wall to where you begin the first catch- maybe about 5 meters for most. Then count your strokes to the far wall. (I recommend my method of counting strokes below to get a more accurate reading.) Then do some simple division 20 meters / 16 strokes = 1.25 meter stroke length. Stroke Per Length (SPL)– the number of strokes taken per length of your pool. Usually swimmers are comparing SPL in 25 yards or 25 meters. * To convert some measurement in a yard pool to a meter pool figure mutliply by 1.0936. Vice versa mutliply by .9144. Stroke Rate (SR)– this is also called tempo. SR is the seconds it takes between each stroke (each arm). How to calculate SR… it’s more of an estimate really. First estimate how many seconds it took to glide to that first catch. Then count your SPL and record the time it took to complete the length. Subtract the glide seconds from the overall time, then take that figure and divide by your SPL. For instance. I glided 6 meters to my first catch in 3 seconds. It took 23 seconds to complete the 25 meters and 16 SPL. (23 seconds – 3 seconds) / 16 SPL = 1.25 seconds per stroke. 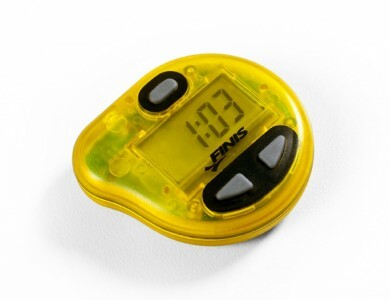 Tempo Trainer– a little device, about the size of a watch, that you slip under your swim cap. You set it so that it beeps at you on a certain interval, then you match your stroke to it. You can use it in several different ways.